"If you look at the trends over time, you can often see ups and downs of that magnitude," said Dr. Andrew Wheeler, assistant professor of criminology in the School of Economic, Political and Policy Sciences. The rise and fall in homicide rates suggest that long-term factors such as segregation and/or concentrated poverty play a more important role in the increases, said Dr. Tomislav V. Kovandzic, associate professor of criminology and co-author of the study. "That doesn't mean we shouldn't pay attention to short-term spikes, as they may—if not addressed—contribute to a city's long-term homicide level," Kovandzic said. "But it does mean policymakers and journalists could be missing the forest for the trees if they insist on focusing on the here and now." 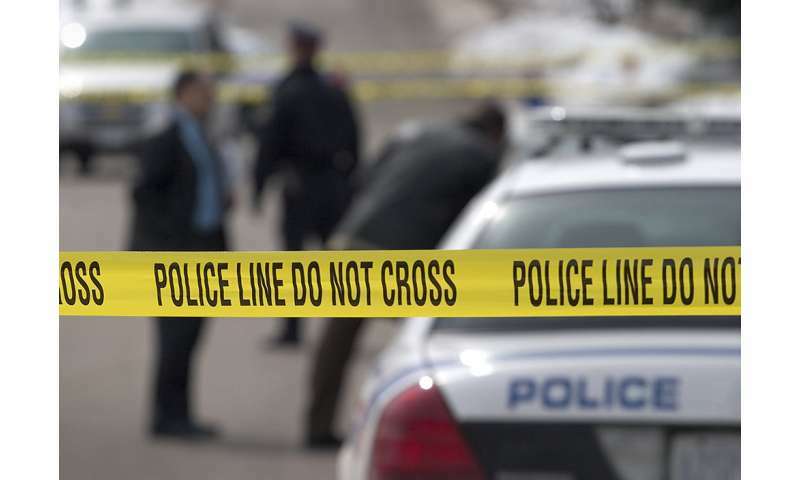 The U.S. homicide rate—5.3 homicides per 100,000 residents—climbed nearly 12 percent from 2014 to 2015, one of the largest increases in decades, according to a U.S. Department of Justice report. It rose nearly 8 percent from 2015 to 2016. The numbers have generated headlines, raised concerns and led to speculation about the causes. Trends in homicide rates are typically calculated by comparing the percentage change from one year to the next. But the UT Dallas study cautions that this method can create a distorted picture. Researchers used a data analysis technique called funnel charts to compare homicide rates between cities with different populations, based on FBI Uniform Crime Reporting data from 1960 to 2015. They found that the increased homicide rates in many cities stayed within predicted levels based on past year-to-year changes. Wheeler and Kovandzic used another data analysis technique—time series fan charts—to examine trends in each city over time. In most cities, the recent increased homicide rates were still much lower than rates in the early 1980s and 1990s. In others, high homicide rates were nothing new. For example, cities including St. Louis and Baltimore had experienced high homicide rates for decades. In 2015, the homicide rate in Milwaukee was one of the nation's highest at 24.3 per 100,000 residents. The study found that the predicted rate for the city would likely fall between eight and 23 homicides per 100,000 residents based on rates before 2015. As a result, the increase was only slightly more than what could have been predicted based on Milwaukee's history. The study also questions theories about homicide increases in some cities. For example, some attribute the rise in homicide rates in Chicago and Baltimore to decreases in police stops and arrests that resulted from civil rights litigation. But the authors point out that New York City, which also has experienced decreases in stops and arrests, has not seen increased homicide rates. Understanding expected changes in homicide rates over a longer period of time can prevent the media, policymakers and the public from misinterpreting fluctuations, Wheeler said. "We hope that this information can illustrate that homicide rates are volatile, so it's important to consider the size of a city and historic levels of homicide when analyzing homicide rates," Wheeler said. "Researchers focusing only on very recent homicide trends are likely to overestimate the effect of recent events."